Scott Pruitt, President-elect Donald Trump’s pick to lead U.S. EPA, met with Sen. Heidi Heitkamp (D-N.D.) yesterday. Photo courtesy of Heitkamp's office. Conservative activists have stepped up their lobbying in support of Scott Pruitt, President-elect Donald Trump's pick for U.S. EPA administrator. Today, 24 conservative groups sent a letter to senators pushing them to confirm the Oklahoma attorney general as head of the agency. "Mr. Pruitt is highly qualified to lead the nation's chief air and water regulatory agency. We fully endorse his selection and urge the Senate to confirm Mr. Pruitt as the next EPA Administrator," the groups wrote. Those signing on to the letter included Michael Needham of Heritage Action for America, Grover Norquist of Americans for Tax Reform and Tom Pyle of the American Energy Alliance, as well as leaders of several other activist organizations and think tanks such as FreedomWorks, the Club for Growth and the Competitive Enterprise Institute. The groups say Pruitt has been a defender of states' rights against "federal intrusion," noting his legal battles against EPA over the Clean Power Plan and the Waters of the U.S. rule. They said they hope that EPA under Pruitt will work with the states on its mission to keep the country's air and water clean. The letter is now part of what has become a lobbying campaign by conservative groups in support of Pruitt. "We are encouraging our activists to call in to their senators to tell them to support this nomination," Chris Warren, an AEA spokesman, told E&E News. FreedomWorks also said this week that it has driven thousands of contacts to the Senate from its grass-roots members in support of the Oklahoma attorney general's nomination. In addition, the group set up nine office visits to discuss Pruitt's nomination. Offices visited included Sens. Sherrod Brown (D-Ohio), Tim Kaine (D-Va.), Bill Nelson (D-Fla.) and Mark Warner (D-Va.). FreedomWorks has also said that it will "key vote" Senate committee and floor votes on Pruitt's confirmation for its congressional scorecard. 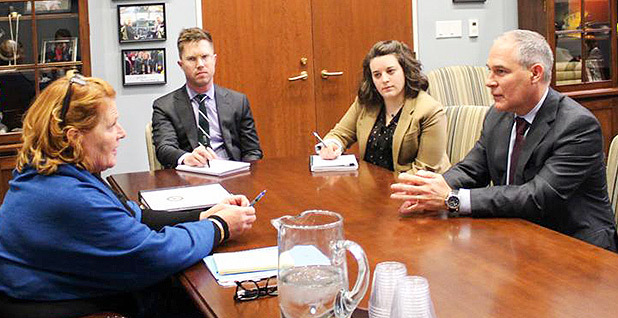 Pruitt continued to make the rounds of Senate offices this week to drum up support for his confirmation. In a statement yesterday, Sen. Heidi Heitkamp (D-N.D.) said she had met with Pruitt, noting that they discussed "a true all-of-the-above energy strategy" and "a strong Renewable Fuel Standard." The two also talked about how to address "the harmful impact of overbroad and unrealistic rules" like the Clean Power Plan and the water rule. As a moderate Democrat, Heitkamp could be a swing vote in support of Pruitt. His confirmation has become one of the tougher battles for the incoming Trump administration as liberal Democrats and environmental groups have campaigned against him. The Sierra Club today released two ads as part of its digital campaign against Pruitt's nomination. The ads are set to run in 14 states — including Nevada, North Dakota, Pennsylvania and South Carolina — as well as in Washington, D.C.
"We will continue to mobilize and hold our senators accountable, ensuring that the future of our climate and environment remains intact and safeguarded from Scott Pruitt and his fossil fuel supporters," Sierra Club Executive Director Michael Brune said in a statement. Sen. Sheldon Whitehouse (D-R.I.) and Senate Environment and Public Works Committee ranking member Tom Carper (D-Del.) spoke out today against Oklahoma Republican Attorney General Scott Pruitt’s nomination for U.S. EPA administrator, along with pregnant women. Photo by Geof Koss. 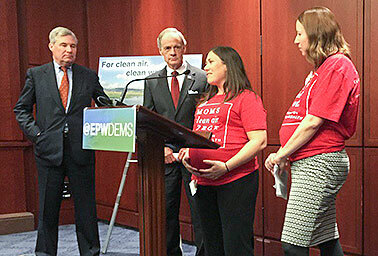 Also today, Democrats on the Senate Environment and Public Works Committee, which will consider Pruitt's nomination, appeared with Moms Clean Air Force and other environmentalists to demand that policy at Trump's EPA be driven by science, not politics. "We need an EPA that listens to doctors, an EPA that listens to scientists, rather than just special interests, when it comes to setting crucial health standards to clean our air, clean our water and protect us from toxic chemicals," EPW ranking member Tom Carper (D-Del.) said at the Capitol Hill news conference. Sen. Sheldon Whitehouse (D-R.I.) lamented what he called an organized conspiracy to cast doubt on science, which he likened to the tobacco industry's decades-old efforts to sow confusion over the dangers of smoking. "We talk about people who don't pay attention to the science, we talk about people who deny the science; that is actually an understatement of the case," he said. "They don't just ignore the science, they have visibly gone about creating a false alternative science that they can put next to real science, create doubt about real science and delay action." Sen. Ed Markey (D-Mass.) accused Pruitt of wanting EPA to stand for "Every Polluter's Ally." "We are going to make sure that's not the case," he said. Also addressing the event was Trisha Sheehan, a member of Moms Clean Air Force from Pennsylvania and the mother of two boys with a third due next month. "As moms, we ask that any EPA chief should put the health of American families and the safety of our communities first, be guided by science, and honor the great American tradition of protecting our right to breathe clean air and drink clean water," she said. "Scott Pruitt fails on all three of these basic qualifications."